I have known so many perfume loves, so many different families of fragrance. I have swooned over incense and amber, spice and fruit. I have breathed in the heady rush of tuberose and swooned over jasmine’s eternal beauties, I have laughed with carnations and I have wept for lily-of-the-valley. I have without question loved and adored them all in all their many wonders in all my many times and moods. Yet some loves spring eternal, some refuse to wane, and one family above all others I will love until I die. I can wonder, these many years later, what it was about that family – so imposing, so steely and stately in its perfection, that made me love it above all others and at all times in my life. Was it a chance encounter, one perfumed rite of passage in the Avenue Montaigne as a girl of fourteen, looking for that liquid definition of womanhood and all it meant to be? Was it that heady trail of another family member, wafting behind a woman so chic, she could only live in Paris? That moment on the Pont Neuf, frozen in time and memory – her shining, carefree hair, blowing heedless in a soft May breeze over the Seine, the click-clack of high heels tapping out a tattoo on the cobblestones, the perfume in her wake and the epiphany it caused for one gawky, bookish girl – that was what it meant to be a woman, that attitude, that fearless posture, that impossibly beautiful, impeccably seamless trace…of chypre. Or was it simply one girl’s determination to mark out her own perfumed turf and stake her own claims on the world, which at fourteen meant one thing…anything her mother wouldn’t wear. So goodbye to Mitsouko, farewell Shalimar, adieu Jolie Madame, au revoir L’Air du Temps, all immortals that you are…one newborn girl-woman swore her undying fealty to the chypre…and there it remains. It was the second renaissance of chypres in the late Seventies…who had already said hello to Chanel no. 19 and showed no signs of stopping. In those days and for many years thereafter, many famous chypres gave me steel for my spine and an aura of confidence when I needed it. I wore Miss Dior to Clash concerts and Fidji to demonstrations, Dioressence to political rallies and Vent Vert when squatting with my eighty closest friends in closed down museums. I wore Bandit for very close encounters. They defined my life as no other family of perfumes ever has, until that heartbreaking Sleeping Beauty moment I woke up and discovered…they were gone. Yet hope did not escape that jar – for I also discovered I wasn’t alone in my love for these Green Fiends. And I discovered Dawn Spencer Hurwitz, who blew me completely to dandelion fluff with her Vert pour Madame, and several times since. Now, with ‘Pandora’, she had done it again. Simply because ‘Pandora’ blows me to fluff and then takes my breath away. Created to highlight the famous base of so many chypres – the Mousse de Saxe or ‘Saxon Moss’ created by Marie de Laire, ‘Pandora’ – named for a stunning Odilon Redon painting as well as the Eve of Greek mythology – is neither as fiercely green nor as steely-determined oakmoss as some of the great chypres of old. It shares a good deal of its character with its sibling, Vert pour Madame, but Pandora is a shade or two darker, less verdant and more seamlessly floral. The Mousse de Saxe shows itself right from the start, but stealthily and softly, like a sudden silky whisper that takes you by surprise. It is – as well it should be – rich and rounded from the first breath of ozone and aldehyde that makes it sing to my synapses all the way to the gossamer drydown of that mousse de saxe base. It is bright as an errant sunbeam and later dark as the thunderclouds on a far horizon. 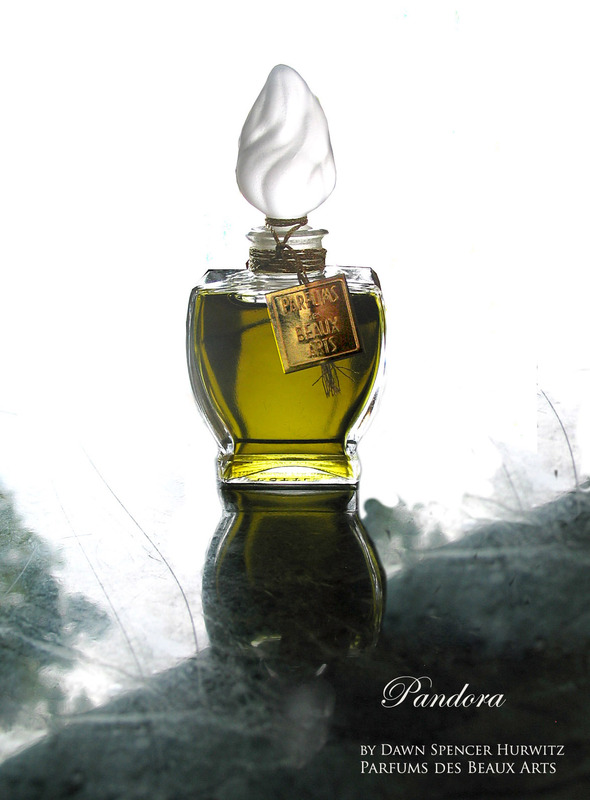 Mousse de Saxe gave a lot of distinction (and basso profondo) in many famous perfume bases. I can’t say it’s happened often that I’ve thought of it as sheer, but in Pandora, it is. She never shouts her presence. Instead, she wraps you in her flawless aura like a shawl made of woven Olympic air, to comfort you and heal all your worldly woes. A thunderstorm rumbles far away outside your window, but it can never touch you here. So she did – and so all the evils of the world befell humanity…but also knowledge, truth and the ability to distinguish between truth and lie, and last, but not least…she remembered to slam down the lid before hope was lost, too! Once upon a time, I, too, felt that hope was lost for perfumery, and lost in particular for all my beloved chypres, never to return thanks to reformulation and IFRA regulations. Once upon a time, I thirsted for knowledge and true artistic vision – a way of saying something I had never heard before, or saying something I had heard before but never quite like this. I wanted perfumed revelations, I wanted journeys to places unknown, and more than anything else I wanted to believe that all hope was not lost. I wanted to believe that somewhere in the world were artists with visions and dreams and that particular elevated effortless sleight-of-hand talent money never buys. Hope was never lost. It bloomed in a dream and a vision Dawn Spencer Hurwitz conjured up from essence and absolute, aldehyde and ambergris she bottled up and called ‘Pandora’. All I have left is my gratitude and to marvel that such beauty can still be dreamed, created and found right when hope is needed most. One doesn’t mock the King of the Gods unpunished. Yesterday, when I grabbed my little sample vial for yet another addictive spray, it slipped from my hand and smashed on the floor. I could have swept up and tossed those spiky shards, but instead, I wrapped them up in tissue paper and one last, final, heartbreaking time, I breathed in the perfume of hope. Disclosure: Sample was sent to me by Dawn Spencer Hurwitz for review.